The primary talking point surrounding the newest romantic comedy has been around this point, and rightfully so, however, the aspects of this film that should be celebrated should not end at the cast. Crazy Rich Asians may be a simple love story complicated by family, the film truly shines as escapism in the lavish glow of Singapore. 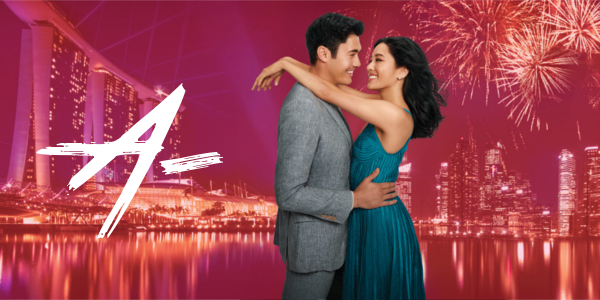 Rachel Chu (Constance Wu) is happy to accompany her longtime boyfriend, Nick (Henry Golding), to his best friend's wedding in Singapore. She's also surprised to learn that Nick's family is extremely wealthy and he's considered one of the country's most eligible bachelors. Thrust into the spotlight, Rachel must now contend with jealous socialites, quirky relatives and something far, far worse -- Nick's disapproving mother (Michelle Yeoh). The romantic comedy genre is teeming with cliches and tropes that have been around in some form or another since the start, something that Crazy Rich Asians even falls victim to. However, the film executes them so well, it reminds one why these were cliches in the first place: they’re effective. In many ways, the film handles like a modern-day Cinderella, that ditches the come from nothing heroine for an independent human being. This particular human being in question is brought to life by Constance Wu, an actress destined for a breakout role like Rachel Chu. Wu brings a quick-witted sensibility with a hint of optimism to the character as she endures vindictive girls and disapproving family members. Her other half, Henry Golding, is equally as exciting, particularly with the knowledge that Crazy Rich Asians is his first film role. Golding doesn’t get the same amount of material to work with that Wu does, but he is ever charming as the favorite of the Young family. Despite both romantic leads being top notch and remarkably easy to love, the true standout is actually Michelle Yeoh as Nick’s icy mother Eleanor. Yeoh presents a formidable obstacle for the young couple, a fierce mother with good intentions and terrible execution. Throughout every moment Yeoh remains composed, with not so much as a crack in sight. The demeanor of Eleanor Young could be applied to the entire film honestly. While the lightweight drama plays out on screen, the elegant natured escapism that director Jon M. Chu has crafted never breaks. While the primary goal of Crazy Rich Asians may be telling a compelling story, the secondary goal is presenting an artful glance into the importance of culture. Chu ensures that themes of tradition and familial relationships are displayed in various forms, particularly a scene involving dumpling making and how the process should be shared from generation to generation. Crazy Rich Asians boasts far more than just an impressive Asian-American cast. The story of love rising above all else may be a tired model amongst the rom-com fare offered over the years, but director John M. Chu and everyone else involved execute it with tremendous precision that reiterates why the themes present are timeless and relatable. One can’t help but fall in love with Crazy Rich Asians, from the visual flare of luxurious lifestyles to the emotions between the charming characters, every piece of this puzzle is worthwhile and the reason Crazy Rich Asians might just be the surprise of the summer.